Time for a little indulgence. Although January is a month of light eating, the desire for something more substantial and velvety arises on cold, rainy evenings. Then we take comfort in slow cooking meat meals with a voluptuous sauce, where we sit back and lick our fingers and sweep the sauce from our plates with fresh chunky bread. This is a recipe from Mariëtte Crafford’s book, Sonskynkafee(Sunshine café), a delicious book filled with stories and great recipes. Sauté the lamb-shanks in oil in a heavy based casserole until nicely browned, cover with the stock, add the lemon juice, cinnamon and bay leaves and cook uncovered until the lams begins to soften. Sauté the onion and add to the lamb. Mix all the spices with the 4 tablespoons of water and add to the lamb. Stir in the yogurt and add the sultana raisins. Simmer gently until the lamb is very tender and the sauce has reduced and thickened. Stir in the cream and leave for 10 minutes to heat through. Serve with rice in bowls, pour over some sauce and finish off with a sprinkling of flaked almonds and fresh coriander/parsley leaves. I almost bought lamb shanks at the Greenmarket this morning and then didn’t because I was feeling uninspired about what to do with them! Now I have a recipe! You photo is making my mouth water and the recipe really sounds delicious! That is a sumptuous looking photo and recipe! Curry sultana. Mmm. 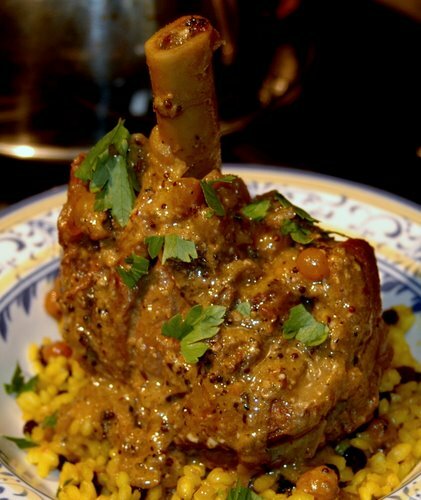 I have never seen a delicious looking lamb shanks like this. They just look superb. The photo is stunning!!! I would love to try try this if I see lamb shanks.. I agree: it IS a lovely photo – you can almost smell the delicious aroma coming from it. My mother came from the same area as Mariëtte Crafford so I may be biased, but I absolutely love her recipes, and I’m sure the lamb shanks is every bit as good as it looks. Voluptuous. Exactly the right word to describe the sauce that results when lamb shanks are slow cooked. I love the feel of the sauce on my lips. what a beautiful photo to match a wonderful recipe! I am passing this recipe along to my mother — she LOVES lamb and this would be right up her alley. Is that Israeli couscous you served it with? This looks delectable! Talk about ‘whetting the appetite’, you have certainly done so here. Fabulous image and I’m sure it tastes as wonderful as it looks. I would class this as modern boerekos – a definite winner. 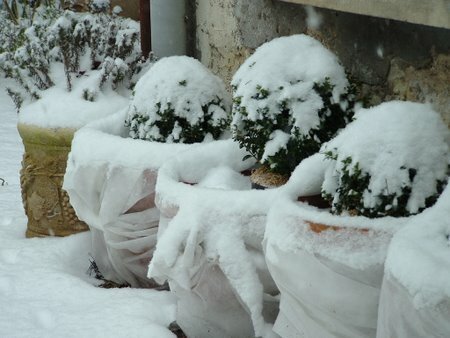 i love your chilly looking pots all huddled together under their snow blanket. Oh, and is it ever necessary to cover this while it’s cooking?